Saying right off the bat that he was in Albany to discuss what was going on with our national government in Washington and wasn’t here to talk about politics, U.S. 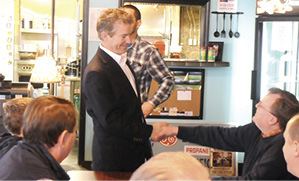 Senator Rand Paul spoke for about 20 minutes last Tuesday afternoon in front of about 65 local people who had gathered at the Corner Stone Restaurant to greet him. Paul, who had just a week earlier ended a failed bid to earn the Republican nomination for President of the United States, stayed true to his word with a brief talk that for the most part, centered around wasteful government spending, tax reform and a constantly growing national debt that was the result. Paul’s visit here was just one stop on a 22 town tour across Kentucky that was slated to last for five days. The Senator’s 1:30 p.m. stop here was his fourth stop that day on a schedule that also included similar visits in Scottsville, Tompkinsville and Burkesville. He was scheduled to end the day after a Town Hall stop in Monticello. Paul was introduced to the crowd inside the Corner Stone by Clinton County Republican Chairman David Cross, who also pointed out several local elected officials who were in attendance, including Clinton County Judge/Executive Richard Armstrong, who told Paul the county needed any help he could send our way, especially in the form of new jobs and opportunities. Paul began by telling the crowd a parable about a little girl who wanted $100 and was told by her parents to ask God, so she wrote God a letter. Not knowing what to do with the letter, the postal service forwarded the letter on to the President, and thinking it was a cute gesture, the president sent the girl $5. In a thank you to God for the money, she noted that the next time He should not route the money through Washington because “they stole 95 percent of it”. Paul said that unlike the state government that has to work within the confines of budget limitations, the federal government refuses to work within the national budget and continues to go further into debt. “In Washington, we don’t ever do that because we have an infinite amount of dollars . . . we just print up more,” Paul said. The Senator pointed out that the nation was $10 trillion in debt when President Obama first took office and said that when he leaves office he will have doubled that figure to a $20 trillion amount, adding more to the national debt than all of the other presidents combined. Still, he also pointed out that the previous administration of President George Bush, a Republican, also doubled the nation’s debt level during an eight year administration, from $5 trillion to $10 trillion, suggesting that perhaps the problem wasn’t a Democrat or Republican problem, but rather a spending addiction that afflicted all members of our national government. On the subject of taxes, and particularly corporate tax structure, Paul blamed high corporate tax rates for the nation losing so many jobs to companies taking them oversees. He pointed out companies that were moving their headquarters overseas where corporate income taxes were much lower than in the United States, giving two examples of Burger King, who has moved its corporate headquarters to Canada where the corporate income tax rate is 15 percent, and Pfizer drugs moving to Ireland where the corporate income tax rate is 12 percent. Paul said that in addition, American companies are making huge profits overseas, but won’t bring those monies here because they are heavily taxed to bring the profits back into the United States. As one solution, he proposes lowering the rate for companies to bring profits back into the United States from the current rate of 35 percent, to just five percent, for one year, in order to entice those companies to bring the profits back rather than leaving them overseas. “When we did that before, back in 2005, $300 billion came home,” Paul said. He explained by saying that by offering this opportunity for a year, it would actually result in an increase in tax revenue for the United States, adding that he further proposes to take that additional money, and put it into the road fund, saying regardless of a person’s political party, everyone needs good roads. He also he hoped to see the nation concentrate more on our own problems and less on the problems around the globe. During a brief period that followed, Paul addressed a handful of questions and comments from some of those in attendance, including more talk about tax reform, abortion, the recent death of Supreme Court Justice Antonin Scalia and President Obama. The senator, who pointed out that he had returned $2.4 million back from his own budget to the taxpayers, also said that as for the U.S. tax code, his solution was a simple one. “My proposal would be to get rid of the entire tax code and the IRS, and you would have a flat 14.5 percent rate for businesses and 14.5 percent for individuals and you could fill out your entire tax form on a postcard,” he said. Among the benefits of such a system, Paul noted, would be the simplicity of the system, adding that the revenue would, after an estimated 10 year period, be about the same but there would be far less jobs lost overseas. Kentucky Senator Rand Paul, fresh off of a campaign for the Republican presidential nomination, spoke at the Corner Stone Restaurant in Albany last week, giving updates on issues from his Washington post. At left, he began the appearance greeting those who had gathered, including this table that included Commonwealth Attorney Jesse Stockton.